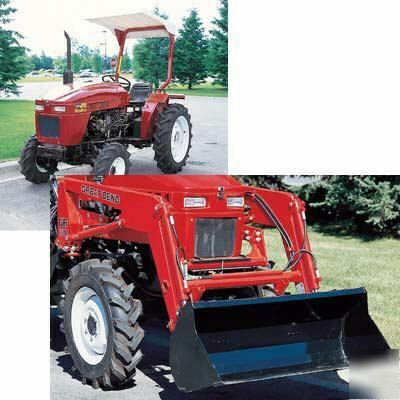 The ideal tractor to have for around the home, at work or on the farm! 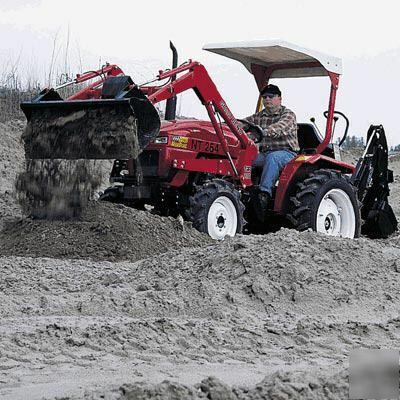 Use for plowing and hauling big loads along with other agricultural and industrial activities. FREE power steering is included. 540 and 1000 RPM PTO. 2 stage clutch with live PTO. Three cylinder liquid-cooled diesel. 4-wheel drive works great for pulling out of mud and snow. Control panel includes fuel gauge, oil pressure gauge, hour meter and Amp meter. 3 point category 1 hitch. Canopy also included. Includes Limited 6 Month Parts/Labor Warranty. See below for additional product information. Lift capacity to full height at 2600 PSI: 930 lb. Maximum lift height (ground to lower bucket pin): 78 1/2in. Clearance with bucket dumped: 64in. Reach at maximum height (front of tractor to front of bucket): 32 1/2in. Overall height in carry position: 4ft. 9in. *NEVER ATTEMPT FULL ROLLBACK IN RAISED POSITION WITH FULL BUCKET.